Costa Azzurra by Tom Ford is an aromatic woody unisex fragrance. The niche fragrance is inspired by the scenery of Sardinia, captivating fragrant woods, pines, the salty sea breeze, sun drenched citrus and herbs. It begins with notes of driftwood, oud, seaweed, cardamom and celery seeds. Refreshing notes of lemon and mandarin along with lavender, juniper and artemisia form the heart. The base consist of vetiver, oak, vanilla, incense, olibanum and lentisque. Costa Azzurra comes in a gorgeous azure blue coloured bottle, and is part of the exquisite Private Blend collection. This refreshing scent can be enjoyed on its own, but can also be layered with other scents from the popular collection. 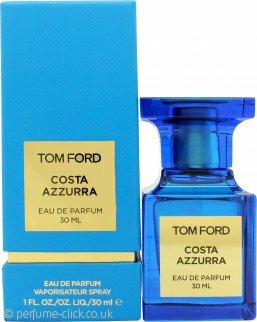 Costa Azzurra by Tom Ford was launched in 2014.